View cart “Vowel Practice Pictures: Hundreds of Drawings Organized for Vowel Practice” has been added to your cart. 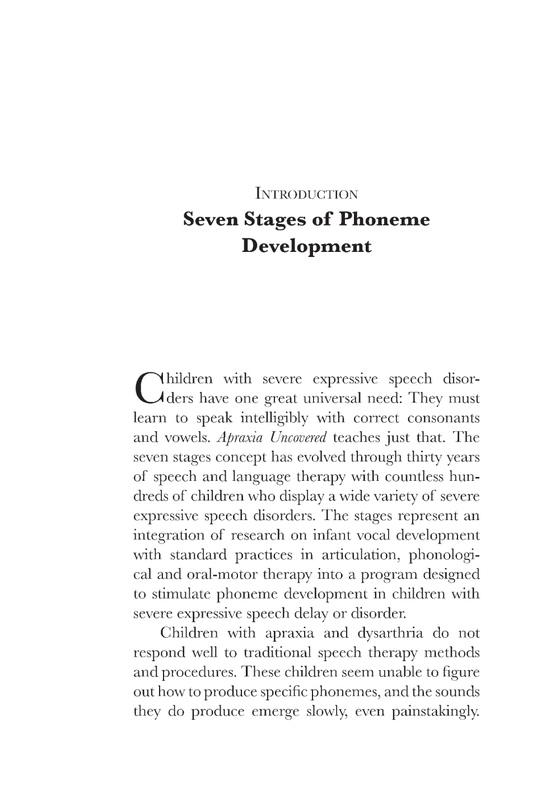 Pam’s second material on childhood apraxia presents a deep perspective on speech sound development. This material is presented as a book and as a 3.5-hour audio seminar over three CDs. This course is available for ASHA CEUs and/or Continuing Education Hours and is also available for group CEUs (see below). Download the first 31 pages and begin reading today! Using a month-by-month developmental framework, Pam describes how to nurture sound development in children who have great difficulty learning to make sounds and speech. 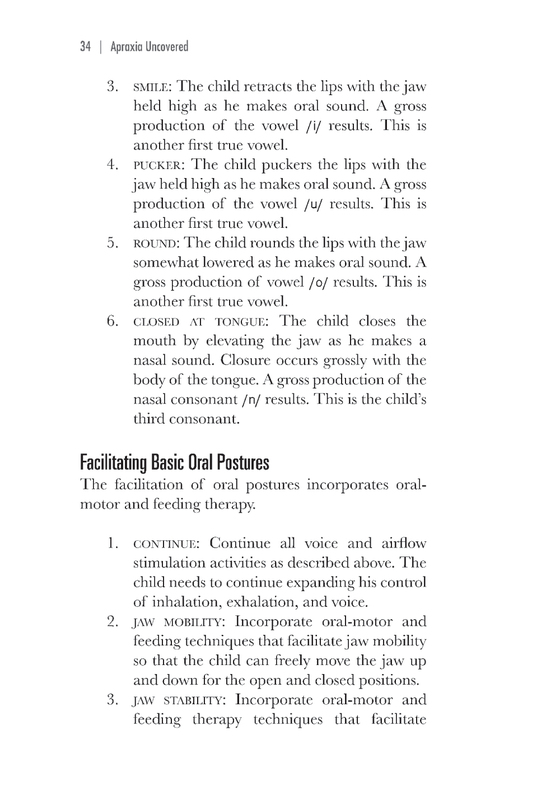 Pam Marshalla integrates information from articulation, phonology, oral-motor, and infant vocal development into a comprehensive plan of treatment. Apraxia Uncovered will help you understand how to help the child make a wider variety of consonants, vowels, syllables and words, and to become more intelligible. Techniques are appropriate for children of all ages. Pam has written this book and recorded this seminar in such a way that you will be able to follow the content. However, before you dig into this rather detailed material, Pam recommends that you read her earlier book, Becoming Verbal With Childhood Apraxia. 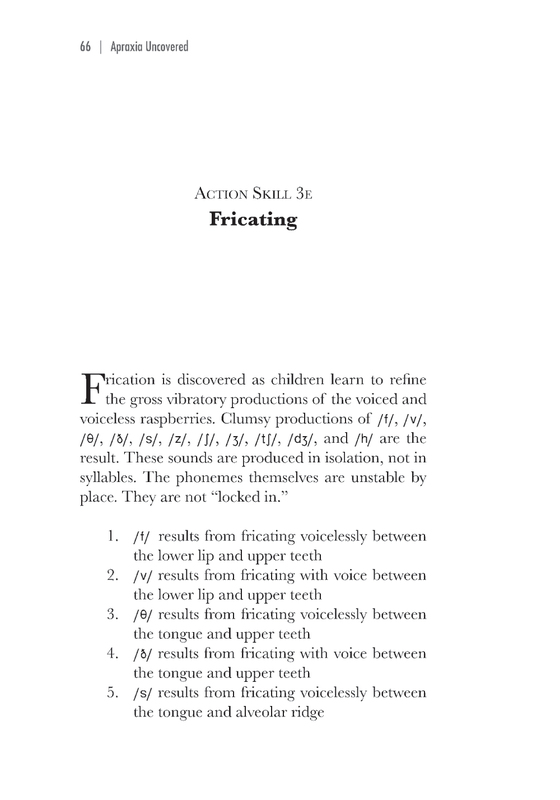 Can you tell me how your books “Becoming Verbal With Childhood Apraxia” and “Apraxia Uncovered, The Seven Stages of Phoneme Development” are different? Which one should I read first? Think of Becoming Verbal With Childhood Apraxia as Part 1. It is about how to get kids more vocal, verbal, communicative, imitative and interactive, and how to get them to play with the sounds they make. Read it first. 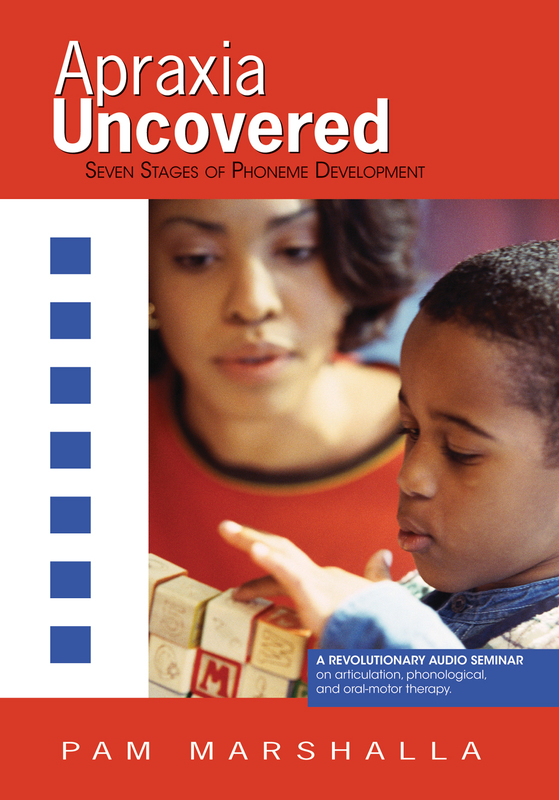 Think of Apraxia Uncovered, The Seven Stages of Phoneme Development as Part 2. 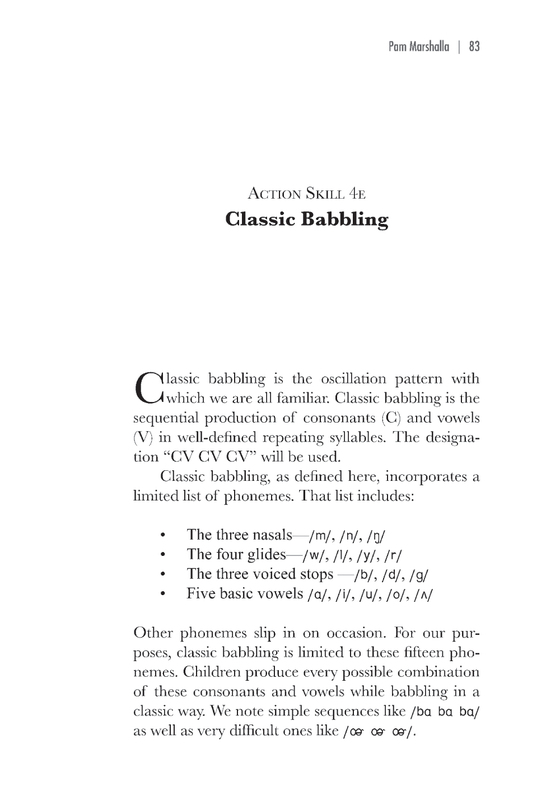 It is about how sound develops over time – from the vocalizations of the infant to the sophisticated consonant and vowel sequences of the three-year-old. Read it or listen to the recorded seminar second. All book+CDs sets are mailed with continuing education enrollment instructions. After listening to the lecture, please register for your CEUs on our website here. If you do not wish to receive ASHA CEUs for this course, we are happy to give you (only) a certificate of completion after you watch the video — you will be given instructions on how to opt out of ASHA reporting when you submit your paperwork to us. For those who would like to share the book and CD Set, we offer individual CE enrollment for $25 per participant. Group participants will all receive a handout to use when listening to the lecture together. Already Purchased The Book & CDs? For those who purchased the book and CD set, together or previously, before they were available for CEUs, we offer individual CE enrollment for $10 per participant. With this purchase, you will receive a link to download the CE Information letter for this course which includes information on how to register for CEUs for this course, including your enrollment pin. Marshalla Speech and Language is an approved ASHA Continuing Education Provider. This course is offered for 0.35 ASHA CEUs (Intermediate level, Professional area). Financial Disclosure: Pam Marshalla was the owner of Marshalla Speech & Language (MSL), through which this CD and book were originally published and from which she received a monthly salary. Pam Marshalla passed away in June, 2015. This CD set and book continue to be published by MSL. Non-Financial Disclosure: Neither Pam Marshalla nor Marshalla Speech & Language have any non-financial relationships to disclose. The participant pays ASHA CE Registry fee directly to the ASHA National Office. The annual ASHA CE Registry fee allows registration of an unlimited number of ASHA CEUs for the calendar year. Contact the ASHA CE staff at 800-498-2071 or visit http://www.asha.org/ce/CEUs for CE Registry fee subscription information. Your Apraxia Uncovered program has been a big asset to my therapy tools. The breakdown of each stage has helped clarify progress that is being made that I may not have recognized previously, e.g. listening for prolongation. It is helping me set more appropriate goals as well. It’s making this slow process of speech development more encouraging for the families too! I found Apraxia Uncovered to be extremely powerful in my understanding of apraxia and how to better treat my young students experiencing speech motor planning issues! Thank you. 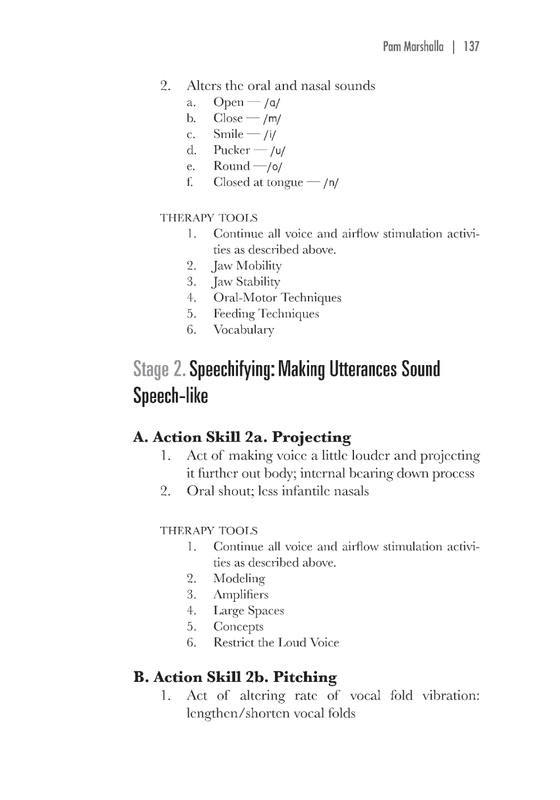 I have found this book so helpful for my understanding of speech development. 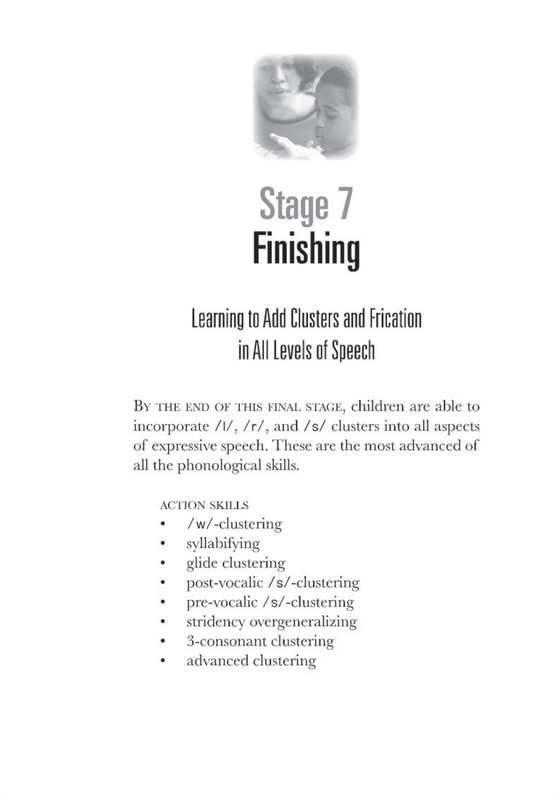 Marshalla really explains phonological development and how our understanding of the natural progression can help us with so many clients when we overlay the process (stretched out or compressed) over our clients’ progress. Love this book. Thanks for making the process easy to understand and teach! I want you to know that I appreciate your help with this important matter in our son’s life. I consider this book a “must have” for my library. I refer to it again and again as a resource to determine next steps for interventions with children on my caseload. Thanks Pam! I am sooooo pleased at the improvement in my awareness and understanding of speech sound development since doing Pam’s Apraxia Uncovered program. Thank you!